At Yalta and Postdam, the Allies redrew the borders of Germany, making it a quarter smaller than it had been after the Treaty of Versailles . Germany was divided into four occupation zones to be occupied by the Soviets, Americans, British and French - known as the ACC Allied Control Council. Berlin, was likewise jointly occupied. The Lander (states) of Mecklenburg-Vorpommern, Brandenburg, Saxony, Saxony-Anhalt, Thuringia, and the eastern sector of Greater Berlin fell in the Soviet Zone of Germany (in German: Sowjetische Besatzungszone, or SBZ). The former German provinces of East Prussia, Farther Pomerania, East Brandenburg and Silesia were given to Poland and the Soviet Union. 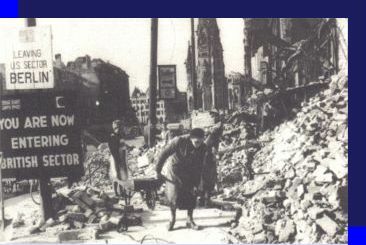 On of the Trummerfrauen (rubble women) who cleaned up the rubble left after the war. Artificial hills such as Teufelsberg were created from the huge amount of debris . The Allies agreed that the occupation was to be temporary and Germany should not be allowed to become strong enough to threaten Europe again . 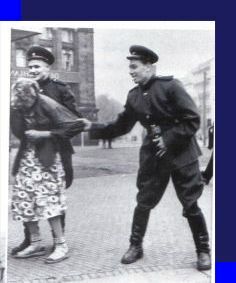 The Soviets, who had suffered massive devastation clamoured for reparations .Germany was supposed to remain united, with all four zones coordinating their occupation policies .After the occupation of its German sector, the Russians began nationalisation of industry and other reforms in their zone which made unification almost impossible . Land reform was begun, with land held by former Nazis being expropriated. Banking and industry were nationalized. There was considerable public support for the nationalization of industry and banks, as many felt they had profited from the Nazi years of power .Many land owners were herded into collective farms, accused of being Nazi activist or American spies . Old Nazi camps were used, often with old Nazis as guards. However, there some who had optimism for the new state, after all, Karl Marx was German, and there were socialist and Communist movements in pre-Nazi Germany such as the Spartacist League (Spartakusbund) .It was joked at the time that if anyone could make communism work, it would be the Germans. However, in view of increased concerns by the U.S.'s General Lucius D. Clay and its Joint Chiefs of Staff over growing Communist influence in Germany, plus Europe's now-plunging economy, in summer 1947 U.S. Secretary of State General George Marshall, citing "national security grounds" was able to finally convince President Truman to rescind directive JCS 1067. It was replaced with JCS 1779, which completely reversed JCS 1067. Among other features, it stated that "An orderly, prosperous Europe requires the economic contributions of a stable and productive Germany. 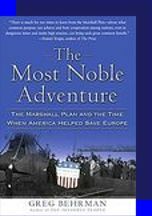 The effects of the Morgenthau Plan were far more wide-reaching than originally predicted. The effect of Germany's industrial economy on that of Europe's total economy was greatly underestimated; after the Plan's implementation, the now-suppressed German economy began dragging down the whole continent's economy. Conditions became so bad that William L. Clayton, an economic adviser to then-U.S. President Harry S. Truman at the Potsdam Conference, reported back to Washington, D.C. that "millions of people are slowly starving." Former U.S.President Herbert Hoover in one of his reports from Germany, dated March 18, 1947, argued for a change in occupation policy, amongst other things stating: "There is the illusion that the New Germany left after the annexations can be reduced to a 'pastoral state'. It cannot be done unless we exterminate or move 25,000,000 people out of it." The occupation zones into which Germany was divided had been decided upon by the European Advisory Commission in Sept 1944 .At the Postdam conference in 1945 the Allies agreed that Nazi war criminals should be brought to trial and that party members brought to office .Democratic political parties and trade unions were to be permitted, freedom of the press and religion were to be allowed and local government should be run by Germans under Allied supervision . The hope that the Soviet zone of Germany might have a degree of independence from the USSR began to fade in 1946 . As the U.S. and Soviet policies toward Germany changed in light of its terrible economic conditions, the former Allies grew apart. To Stalin, it remained essential to destroy Germany's capacity for waging another war; this conflicted with U.S. desires to re-build Germany as the economic center of a stable Europe. Little common ground could be found, and attempts between the two superpowers to further clarify post-war plans for a unified Germany stalled. 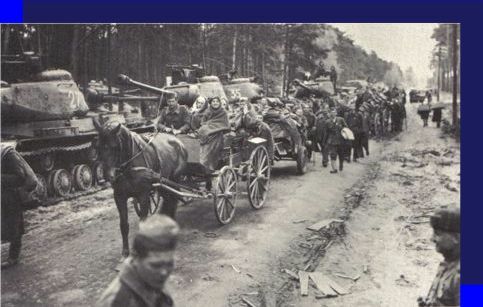 In 1946 the Soviets stopped delivering agricultural goods from their zone in eastern Germany, and Clay responded by stopping shipments of dismantled industries from western Germany. has returned to Berlin for the Potsdam Peace Conference. 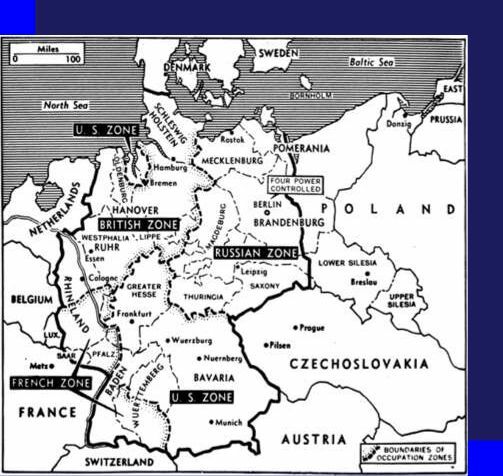 The U.S. stance was that if it could not re-unify Germany with Soviet cooperation, the West should develop Germany's western, industrial portions (controlled by the UK and U.S.), and integrate these areas into a new western European sphere known as the "Bizone" (to be re-named the Trizone, when France would join it). Led by the U.S., these three major Western powers reached an agreement on this approach during a series of meetings in London, from February to June 1948. As outlined in an announcement on March 7, 1948, the London Conference declared support for fusing the three Western zones of Germany into an independent, federal form of government, and bringing Western zones into the U.S.-led economic reconstruction efforts.